Tantalizing, wasn't it? It was a cruel joke played by Mother Nature to give us a one-week peek at spring. Now it's back to hiding indoors as another blanket of snow covers our environs. Well, there's always TV to keep us occupied. Alas, even that may cause consternation. I watch a lot of television and I am unashamed of that. My father, Big Don, owned one of the first TV stores in Flint, so I was hooked early on and that never changed. Still, some things on television get under my skin. For example, that poor guy who has “fallen in the park and can't get up.” He's fallen in a public park in the middle of the day and has to call a service for help. None of the other park users will help him? What kind of a heartless town does he live in? Geez, if I fell in a Cadillac park there would be a dozen fellow Cadillacans rushing to my side in about ten seconds. This guy needs to move to a new city that has nicer people. Sports announcers are get on my nerves, too. When they murder the English language with usage crimes like “have went” and “has ran” I want to reach into the screen and put a strip of duct tape across their mouths. Most of these geniuses are supposed college graduates, so every time they speak they embarrass their university. Sometimes what the people on TV say is unimportant, though, because you can't hear the dialog anyway. That's because the TV powers-that-be have decided that loud music should play in the background of every conversation thus rendering all speech unintelligible. Most of the time the music isn't even appropriate, like when there's a homicide scene and “Tiptoe Through The Tulips” is playing. The only advantage to this music proliferation is that it helps you identify bad shows because the shows with the most inept scripts and horrible acting play the loudest music. The most perplexing shows, however, are the ones that deal with hunting for houses. You know, the shows that give potential home buyers three properties from which to choose. After watching all the variations of this genre there is one general rule which applies (in about 90 percent of the cases) – they will choose the house that makes the least sense. For instance, the couple has eight children, three dogs, five cats, ten chickens, and a mother-in-law who will be living with them. They look at two houses each with five bedrooms, four bathrooms, a big yard, a mother-in-law suite, all brand new, and under budget. They, however, choose an over budget one-bedroom condo with only a half-bath located on an expressway underpass. Then there's the tiny house people. They always seem surprised that the house is “really tiny.” Hey, get a TV listing and look up the title of the show! There may be a clue as to the size of the house. And you know all those clever hidden storage features, expandable sides and clever small design elements? The travel trailer and RV people had all those figured out about fifty years ago. Where have you been? From an international standpoint, one of the shows has Americans moving to a foreign land. I love the movers who do not have any jobs lined up. One common idea is to become a photographer and take pictures of the city (like Amsterdam) in which they will be living and then sell those photographs. Right, like all the Amsterdamians have never thought about this and are just standing around waiting for some nitwit from Nebraska to come over and implement the idea. The main program in this genre is what I call “regular house hunters.” This show is always in an American location. 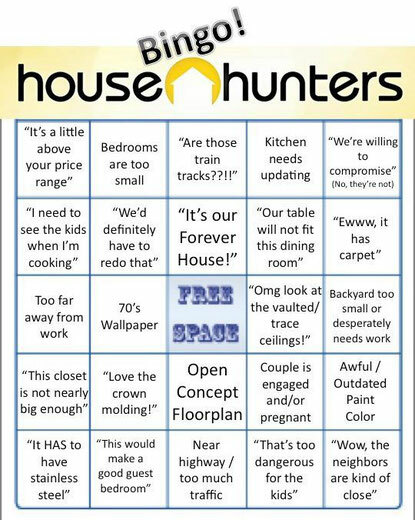 There are some currents that run through all of the shows, so much so that there is a popular game associated with these shows called “House Hunters Bingo.” You can actually print out bingo cards or use online cards to play along at home – http://www.hgtvbingo.com. This game is totally unauthorized and not associated with any network, so besides being funny it's a bit naughty. If all of this is making your cabin fever a bit more intense, have no fear. Pretty soon spring will actually be here to stay and you can turn off the television and go outside. According to the Weather Channel the next Alberta Clipper, Saskatchewan Screamer, Manitoba Mauler, or Yukon Yowler is not anticipated to hit Michigan until at least the Fourth of July. Play the interactive online game at: http://www.hgtvbingo.com.